E-Mini Volatility – The Sky is Falling! E-Mini Volatility – The Sky is Falling! Did you get your $200 per contract today? That doesn’t even count the Pullback trades the Atlas Line provided…just the initial short trade! Again, here’s another large down day trading the Emini. The Atlas Line was dead on telling us to go short 1235.25 due to two consecutive closings. The last couple of months, the E-Mini was very slow. The ATR is now around 3 to 4, showing an improvement in volatility, making for better trading. In the video, John acknowledges non-US traders who prefer to trade the E-mini’s overnight Globex session. 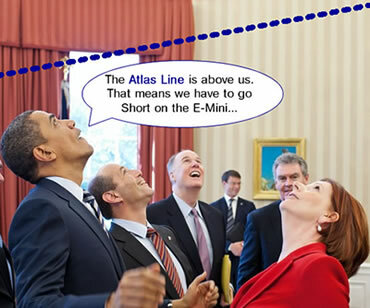 Overnight, the Atlas Line produced a short entry at 1257.75. It’s important to check the ATR if it’s above 1 before trading the overnight session. Many times, the ATR is not volatile enough to produce decent results. In this case, we recommend moving to a market with more volatility. This applies to other strategies besides price action trading. John Paul, day trading coach, teaches traders how to recognize opportune times for trading along with identification of custom Atlas Line trades the the Pullback and Momentum setups. This day trading education is included with purchase of the Atlas Line. My brother put me on to daytradetowin, and i missed the last webinar. How often do you put on these free teaching to trade webinars on price? If you’ve got a skill, protect your trading by not doing dumb things like trading into a news event. its a great video and information about day trading.